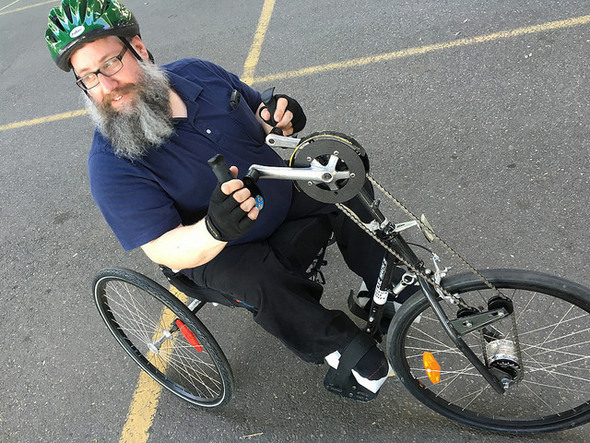 Richard Fletcher rides an adaptive bicycle at the 12th annual Adaptive Bike Clinic in June 2016. Photo by Jonathan Maus, BikePortland.org. (Feb. 24, 2017) Are you or someone close to you interested in bicycling, but due to ability or preference find you are unable to use a conventional bicycle? You can stay informed on the process by visiting the project website here: www.adaptivepdx.org or contact Liz Hormann, elizabeth.hormann@portlandoregon.gov or 503-823-5086.